Lions and guests get together to welcome Chinese lunar new year. 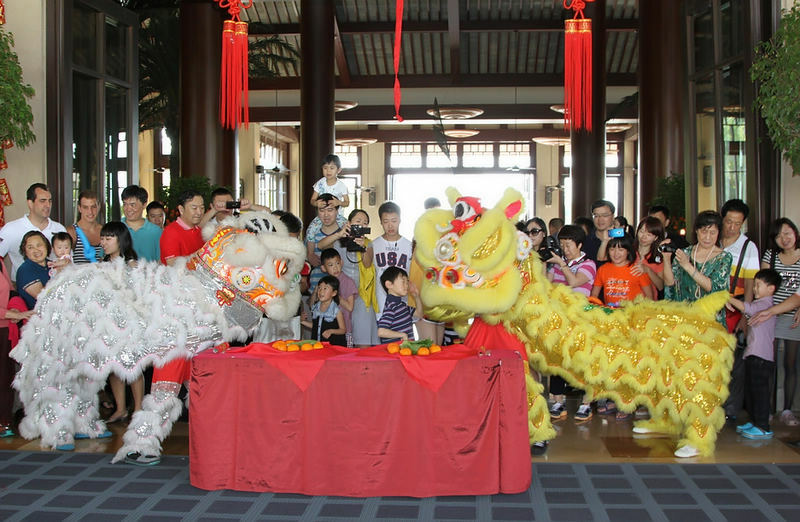 In celebration of the Chinese lunar New Year, a splendid lion dance performance was held at the lobby area of Hilton Sanya Resort & Spa on 1st day of Spring Festival. Lions present Chinese couplet and make wishes for the prosperous year of the Snake. After hotel management team dotted eyes for two lions, the two lions were full of energy and started colorful performance. Numerous guests experienced the joy of occasion, where the two lions showered all with prosperity, good health and luck! Following that was the “Cai Qing” ceremony and lions presenting Chinese couplet which wishes the hotel and guests a prosperous Year of the Snake. Hilton Sanya Resort & Spa features a total of 492 guestrooms, suites and villas. It commands a prime location on 400m of unspoilt beach front at the western end of Yalong Bay, a 35-minute drive from the city of Sanya and 45-minute drive from the international airport. The average room size will be 48.5sqm, with over 50% of the rooms overlooking a wide, crescent-shaped sandy beach and the South China Sea. The remainder has vistas over the surrounding National Park. A 6780sqm Spa Retreat that encompasses a spa with eight treatment pavilions, a fitness centre offering exercise equipment, a relaxation area with deck lounges, steam room and sauna, and a tea lounge. Other facilities include seven restaurants and bars, a 3800sqm resort pool resort, two tennis courts, Kidz Paradise, Water Sport Centre and a one-stop Yalong Bay Adventure Club. The resort also features a detached all-inclusive MICE Pavilion that offers extensive meeting and banquet facilities, more than 3000sqm of space in two storeys as well as two spacious outdoor event lawns.